Hotel Auditorium, Madrid. Auditorium Hotel Madrid. 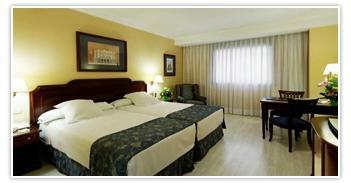 Auditorium Madrid Hotel is a big complex located close to Barajas Airport, not far from the Trade Fair Juan Carlos I. The hotel is the ideal choice for both leisure and business travellers. The hotel has its own conference centre "Principe Felipe" offering 56 meeting halls in 15,000 square metres equipped with the best equipment. Available at the hotel a restaurant offering an à la carte menu specialized in Mediterranean dishes, a lobby bar, a swimming pool and 869 fully equipped and comfortable rooms.